Carruth, Millay, Thoreau of course, and Abbey. there's heat enough for any of our Augusts. all eight by twelve length and width of it. is what we mean when we say "weed." Raspberries, I find, come on more suddenly than blackberries, and it pays to pick twice a day. I like to have both hands available for this sort of thing, so a nail apron full of repurposed yogurt containers fills the bill. For awhile there, I was just filling the containers, lidding them, labeling them with a Sharpie, "Rasp 13," and popping them in the freezer. But ran into a space problem, so started dumping loads into the slow cooker. There's a high of 91F or so all this week, so the cooker and the water-bath canner were carried out of doors, where they would not burden the house with extra heat. I smashed the raspberries with a potato masher, then put the cooker on high, with a screen over it to let the steam dissipate, held down (it's a but twisty) with a pair of scissors. The cooker sat on "low" overnight, and in the morning the preserves were ready for the canner. The hot plate we use for this is slow (110V is not as efficient as 220V, or gas, which we do not have), but it gets the job done. I labeled the jar lids "Rasp 13." In an older post I mused on future labels, and sure enough, here we are. Meanwhile, in the heat, the garden is doing its own cooking. When not canning, I mostly am moving soaker hoses. The neighbors have all rushed to get in their hay before the next rain, and most of them have succeeded. The local grass seed farmer, though, whose acreage seems to comprise half the valley, had to wait a bit longer to begin cutting for seed, and is caught out; the windrowing machines will be busy for days. Our new cherry trees, which made an effort last year, are sleeping on the job, like most of the apples and pears. The pie cherry down by the mailbox is more reliable. I picked it yesterday as neighbors drove past, waving, and stored the small crop, lightly blanched, in the freezer for a change-of-pace pie next winter. Might have to add a little bit of the rhubarb sauce to get a full-sized pie, though. This tree was quite large and productive at one time but had so much dead wood that I let two shoots on the lower trunk mature a bit, then pollarded it, so this year's crop is as if it were the first one from a young tree. We are getting in greens, and have had enough hot weather to dehydrate two batches of about a bushel each of foliage -- mostly lower, oversized or bolted leaves of collards, cabbages, broccoli, chard, spinach, lettuce, beets, radishes, and turnips -- with some broadbean, oregano, dandelion and mint leaves. This made about three quarts of "veggie crumble" which we use to season everything. Peas are very much in evidence and are being used mostly in salads at present. Today, there is rain. We seldom get rain after all the crops are in -- there are basically two seasons here, wet from November to June and dry from June to November -- but there are exceptions. So this is a very welcome shower as the clay in the garden paths has already formed deep cracks and the creek has dried up. It's coldish, though. I am sitting with yet another cup of coffee by the fire, in a darkish house. I miss the rains of my childhood in the Deep South. These came at intervals throughout the summer, so that one seldom had to irrigate a garden, and they were much warmer than Oregon rain. One could step outside and stand in the downpour, soaking it all in like the earth, and take root and grow in gladness. I try to keep most of the plants that came with the place intact, with an eye to utility. The grapes, being a long way off and not apt to get maintenance, I dug out, despite their maturity, and brought down to the garden, where they did fine. Trees that I cut for wood tend to be of regenerative native species, which I leave to come back from the stump, "eight rods to the stool" as they say in the coppicing trade. There had been a garden across the creek, where we wanted pasture; we were forcibly notified that the site is prone to serious flooding, so we moved all that was left of it -- the elephant garlic -- to the new garden, where it has been a blessing and a curse ever since, like bamboo or kudzu. We were never fond of roses. I think both of us had experience mainly with hybrid teas full of aphids and insecticides hopelessly and haphazardly maintained by relatives and friends. We have nothing against rose hips, mind you. There are some wild roses along the creek that make hips, albeit tiny ones. A good way to "waste" a November day is to gather and gather and gather these, enough for one bottle of infusion. The former owner had one unidentifiable rose bush, a gangly thing entwined with a half-dead crabapple; I thought about getting "rid" of it as it had a tendency to snag me when ever I went by -- a behavior forgiven in blackberries -- it did not have much in the way of bloom and no hips that I could find. But rose petals have uses -- in sachets, salads and so on. I moved the rose to one spot by the front door -- where it attacked us within a few years with its long prickly shoots, and gave us little in the way of blossoms. I was asked to move it and dug it up and tried it on the north side of the house, where it languished but refused to die -- or bloom. We then had other ideas for the spot and I dug out the root ball -- having cut the rose down to the ground for two years running to keep it out of my way. The thing was almost two feet in diameter, and split when I wrestled it out, this time with a come-along suspended from a stepladder. Beloved passed by as this operation ended. "Hard to kill, that one." "Yes," I responded. "I could just throw it over the fence down by the creek, let it become part of the dike. But I'd like to try it in one more spot, maybe feed and water it a little better, see what happens." "Well, it's a climber. I can put the two chunks on either side of a gate, on the corner of the garage, like we talked bout doing with vines, see if i can train it over the arch." "No, not as a bush, but we've been denying its nature. I'll keep it tied back, I promise." Four years later, the roses began to bloom. They're a lighter color than we would have preferred, but have a good strong scent, and the petals are great on a spring salad. 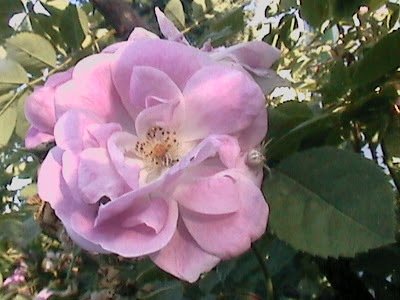 Best of all, they seem to be disease- and pest-free -- a benefit of sticking with old rose varieties.